A4TECH KEYBOARD & MOUSE COMBO FOR Php 33K / $660? Holy Crap! Now we have a candidate for the Extremely Overpriced Tech entry! 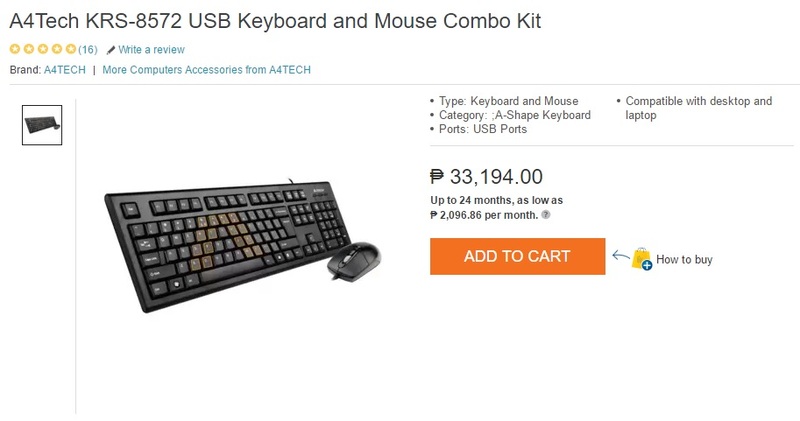 – This Keyboard and Mouse combo seriously from A4Tech itself was spotted on Lazada yesterday. NOTE THAT THIS IS ONLY A BUDGET KEYBOARD THAT IS USUALLY SOLD FOR ABOUT Php 500-600 BUT THE LISTING ITSELF SAYS Php 33,194.00! Don’t get the reason why this price is extremely overpriced? – Even the highest-end gaming peripherals doesn’t price that much. Highest price for gaming peripherals from a high-end brand like Razer should only reach $200-$300, not with that $660 price tag, which is enough for us, to build a 4K gaming PC. We don’t know if this is a joke or the seller itself isn’t aware of the price, but since it is from A4Tech, many people might take it seriously. And thinking about the combination of elegant colors, which is Black and Gold, people may think that this keyboard is premium. Anyway, people are writing hilarious reviews at Lazada and here are some of them. Will A4Tech wants to be the next high-end gaming peripheral manufacturer? Let us know in the comments down below. UPDATE: Unfortunately the offer was taken down at Lazada today (December 16, 2016) – We can’t wait to start the year 2017 with the hilarious things we have in store about technology. Thanks for reading! A great budget gaming mouse if you don't care about anything fancy.